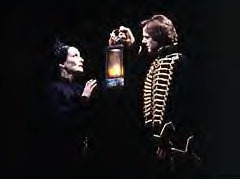 In 1990 a script was written for a proposed silver screen adaptation of Andrew Lloyd Webber's musical, The Phantom of the Opera. Here is an exerpt from that script set after the Maserquerade Ball that reveals Madame Giry's past with the Opera Ghost. MME GIRY is hurrying RAOUL through a more illuminated part of the corridor. Small gaslamps flicker in the gloom. I know no more than anyone else. They have reached a door. MME GIRY stops and looks at RAOUL. She looks back down the corridor. She is very frightened. But she decides to tell him. She turns and opens the door. This is MME GIRY's little flat within the opera house. The furniture is tatty but there are posters of performances, ballet and opera memorabilia all around, the memories of her years at the Opera Populaire. She double locks the door. RAOUL listens as MME GIRY sits down and nervously begins telling her story. Travelling fair in the city. Gypsies. We are closing in on an old photograph of MME GIRY as a seventeen year old girl..
…..and see YOUNG GIRY accompanied by a dozen giggling BALLET GIRLS and escorted by a BALLET MISTRESS moving through a fair in a park under the shadow (MATTE) of the old opera house. (It is currently being renovated and covered in scaffolding.) The FAIR is a shabby, grimy affair, teeming with loutish, leering MEN, WHORES, GYPSIES, and DRUNKS who pester the BALLET GIRLS as they walk past. The tents and the banners proclaiming the various attractions flap in an eerie wind. The impression is one of innocence walking through a grotesque kind of hell. They walk through a corridor lined with AUTOMATS, not unlike those we have already seen in the PHANTOM's corridor. However, here they are dressed and painted in bright colors. In one tent, they see a FORTUNE TELLER, a horrid toothless woman beckoning CLIENTS. A banner announces the "INCREDIBLE MAN-WOMAN". In another tent, a flap is raised to reveal a SIAMIESE TWIN. YOUNG GIRY turns and sees a CONTORTIONIST, his back arched right back and his face, upside down, between his legs. He is laughing. They pass some horrible FREAKS abused by a huge, bearded OWNER with a bull whip. Outside FIRE EATERS, spit fire into the air. Some of the BALLET GIRLS are enjoying themselves. Not YOUNG GIRY, the place is grotesque, a nightmare. They approach one particular banner; "THE DEVILS CHILD" it announces.The vicious OWNER waves them to come in. His smile is disgusting. The BALLET GIRLS drag in YOUNG GIRY. Inside, other CLIENTS, are waiting. The BALLET GIRLS push to the front. YOUNG GIRY sees a CAGE. Inside, his head covered in a sack, a BOY is completing a beautifully delicate housing for a model monkey (the monkey we have already seen on the music box). The OWNER cracks his whip and is shouting at the BOY through the cage. The BOY is chained. He is obviously terrified, scrambling into the corner of his cage. The OWNER, letting fly with the whip, has entered the cage. He kicks the BOY's model and rips the sack off his head. We see the BOY's hands rise to his face, but the OWNER is still whipping him. Pathetically, the BOY's hands descend from his face. We do not see it. Instead, we see a look of shock and immense pity on YOUNG GIRY'S face. Some of the other BALLET GIRLS are giggling inanely. The CLIENTS throw coins which land on the floor of the cage. We see the BOY crawl in the straw to retrieve the sack which he pulls back over head. YOUNG GIRY emerges from the tent and is hurried on by the other BALLET GIRLS and their MISTRESS. But YOUNG GIRY lingers. She looks back at the tent. Something draws her to it.She peers in.And sees, inside the tent, the OWNER, kick the BOY out of the way and pick the money off the floor of the cage. Suddenly, the BOY, with a Punjab Lasso fashioned with the ropes that bound him, strangles the OWNER. YOUNG GIRY watches the BOY garrot his torturer. As the evil man fall dead, the BOY looks up and sees YOUNG GIRY, just as SOMEONE coming into the tent SCREAMS. He knows she won't turn him in. He frees himself of his chains and runs out of the tent. She runs out after him. Behind them, DOZENS OF PEOPLE arrive in the tent. YOUNG GIRY turns and sees, hiding in the shadows, the BOY breathless and terrified. He is clutching the little MONKEY. POLICEMEN with lanterns are closing in through the fair. Quickly, YOUNG GIRY tugs open a trap door at the foot of the opera house wall. With one final look to YOUNG GIRY, the BOY leaps in, carrying his MONKEY AUTOMAT. The trap slams shut over him leaving YOUNG GIRY alone with the light of the POLICEMEN's lanterns sweeping across her. INT. MME GIRY'S APARTMENT. NIGHT. I have said too much, monsieur. She moves towards the door. And comes out into the hall, followed by RAOUL. They disappear down the corridor. At the other end, the PHANTOM emerges out of the shadows.